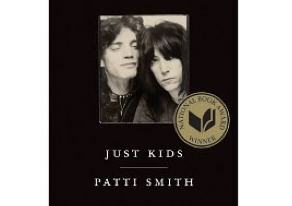 Patti Smith’s Just Kids (2010) could be subtitled Alice In Wonderland’s Updated E! Account. Focused on the years Smith lived in New York City (1967–1979), she memorializes her relationship with Robert Mapplethorpe and their quests for creative authenticity. A whole cast of characters that we associate with those years—Dylan, Joplin, Hendrix, Ginsberg—enter the pages. We all know them but the difference is we sat in the audience, while she is backstage. How many times did I go to the Automat without having Allen Ginsberg try to pick me up? I loved sitting on steps outside brownstones, but Jimi Hendrix never stopped to have a conversation with me. And none of the strangers that I picked up turned out to be Sam Shepard. Smith had more than her share of being in the right place at the right time. She also had other important traits necessary to success as an artist: she worked hard, stayed focused, and trusted (and allowed) her creativity to flow into several arenas. Why would someone reading the SDA NewsBlog find something about Just Kids here? Besides the fact that it is an interesting, gossipy and easy read that will take many readers back to the good and bad times of your youth (the list of deaths is just staggering and each time you read of the tragic loss of another megastar you relive your own painful memories of those times), it is also a good account of the commitment it takes to live your art. The success Smith and Mapplethorpe achieved was certainly facilitated by their patrons, but they owned their own visions. It also reminds you of the importance of a like-minded community to encourage your work. When we gather at conferences – like Minneapolis this summer – and sate ourselves on conversations, lectures, workshops and exhibitions focused passionately on fiber, we are enacting the same play that Smith encountered in New York. We get to rub elbows with our mentors and idols, give praise, receive support, make new friends and create memories that might someday get written up as Just Fiber. I recently received a copy of Twelve by Twelve: The international Art Quilt Challenge (March 1, 2011) from Lark Books…and there was a piece by Gerrie Congdon, our very own SDA website administrator, at the top! Along with a profile photo and bio. Congratulations to Gerrie! Twelve by Twelve addresses the process, theme and product that occurs in the studio, and the power of a supportive and collaborative virtual quilt art community. Written in the style of a journal, each artist voices her challenges, discoveries, and techniques in a personal, humorous way. We peer into their studios, smile as (in Gerrie’s case) they don a mask, and warn you that “It’s not a fashion statement.” They even sign each descriptive entry regarding their blocks. Art is a personal meaning making journey, and we’re allowed inside the minds of 12 makers. It’s an excellent teaching tool, not only for the technique and craft of mixed-media quilting, and the art of conceptual development, but also on the art of online critique, support, and collaboration. These artists built a rich, lasting artistic community FULL of ‘experiential learning’. They are learning as much from their interactions and lives as they do in their studios. Each domain feeds the other, enriching their art and their life. Students rarely see art making examples such as these; it’s vital for them and their development and it also supports the formation of good studio habits. While waiting in line at the checkout in JoAnn’s, I noticed a single copy of 1000 Artisan Textiles (Quarry Books, April 1, 2010) by the sister team of Sandra Salamony and Gina M. Brown. I used my 40% off coupon to purchase it right then and there! The sheer volume of work represented (1000 images, get it?) is like candy to the eye. I’ve been through it countless times and am still finding works that surprise and amaze me. As a felter, I especially appreciated the large representation and varying works in felt. Donna Joslyn (WA) is reading Digital Essentials: the quilt makers must-have guide to digital images, files and more! I finally got around to ordering Gloria Hansen’s Digital Essentials (The Electric Quilt Company, 2008), after saving her chat group answers on digital questions for several years. I do a lot of Photoshop work – so I knew some of it – but it is crammed with tips and useful stuff. Plus it is mercifully written; very clearly and simply, with pictures. She should have left the word ‘quilt’ out of the subtitle, and put in the words ‘image makers’ instead. It’s for anyone who has to prepare images for the web, digital projectors or print, and who uses Photoshop, Elements, or Paint Shop Pro. Good for beginners or experienced computer users. A really useful “how to” and reference book. My copy is now festooned with post it notes. What are you reading? Send a short review of a book you would recommend to other SDA members! Thank you Bhakti Ziek, for validating how I felt when I read Just Kids as well. Never had quite enough ambition, but I was in those Patti Smith audiences at the time. Picked up art quilting in the late 80's, finished my BFA in 2007 under Janice Lessman-Moss, still learning how valuable community is. Besides the unpretentiousness of the writing, there is no mistaking how hard Smith and Mapplethorpe worked at their art, how they were driven but yet somehow ordinary...we should all be inspired, As I side note, I finally saw a picture of the controversial Mapplethorpe piece a month.or so ago.It was gorgeous. I wonder how many people dismiss Mapplethorpe on his title with no understanding of the man?